They are accused of allegedly throwing stones at a vehicle in President Yoweri Museveni’s convoy earlier this month. Bobi Wine, affectionately known as the “ghetto president”, appeared on crutches in court. The army, who had detained him, denied reports that he had been beaten, calling the allegations “rubbish”. 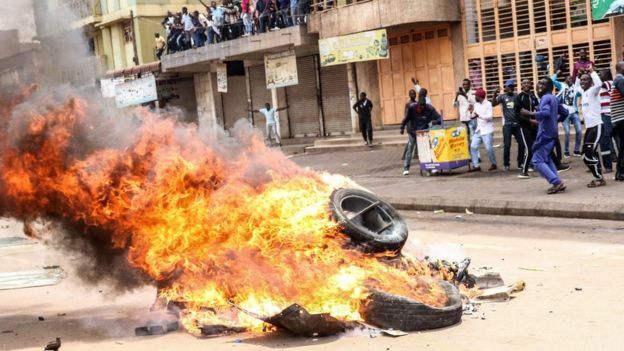 There was a brief commotion in court when one of the accused, a 51-year-old man, fainted and had to be carried away in the packed courtroom, reports the BBC’s Catherine Byaruhanga from Uganda. Bobi Wine’s lawyers said he had been tortured and beaten while in custody and could not walk or talk. The claims were rejected by the government, including by Mr Museveni. The Afrobeats star has been a thorn in the side of Mr Museveni’s government. Since his election just over a year ago, he has backed candidates in three by-elections who have beaten those from the ruling National Resistance Movement (NRM), including in Arua.